The President of International Olympic Committee Thomas Bach and The President of the Organizing Committee of the XXII Olympic Winter Games and XI Paralympic Winter Games of 2014 in Sochi Dmitry Chernyshenko expressed their profound gratitude to the President of CJSC NGO Sergei Novikov for his invaluable contribution to successful preparation and organizing of the XXII Olympic winter Games and XI Paralympic Winter Games of 2014 in Sochi. 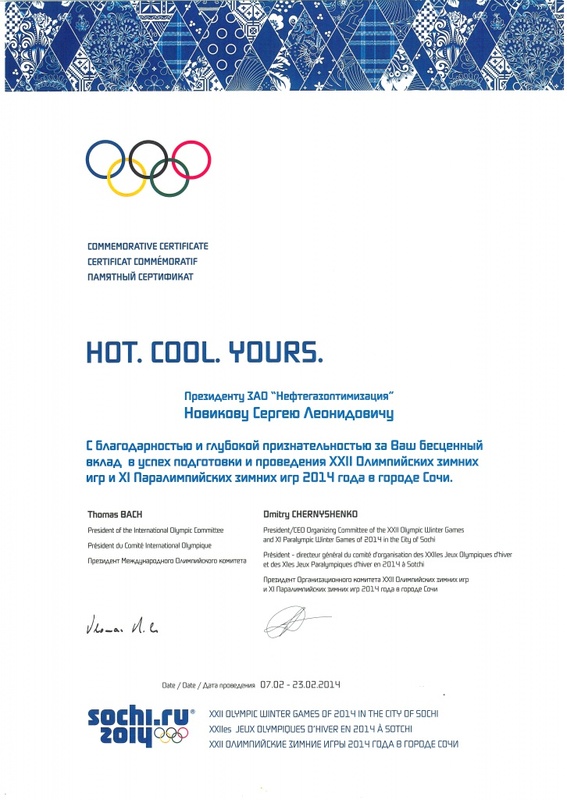 The President of CJSC NGO Sergei Novikov received the personal certificate of gratitude from the President of the Organizing Committee Sochi – 2014 Dmitry Chernyshenko. "Due to your contribution to the common cause Games held at high level and become a real festivity in the whole world. The world saw faces of the new Russia - friendly, patriotic, and open "- says the certificate of appreciation. For the performance of the government contract № NIR- 4 of 30.09.2013 concerning the research project "Development of programs for intelligent transport system in St. Petersburg ", CJSC NGO received an appreciation letter from The of transport infrastructure in Saint Petersburg, which recorded high professional level of work done by CJSC NGO "in the context of the latest scientific developments and achievements in the field of transport systems development in the major Russian and foreign cities"
During the special ceremony dedicated to the closing of the Olympic Games, The Minister of Transport of the Russian Federation Maxim Sokolov presented to the President of CJSC NGO Sergei Novikov the certificate of gratitude for his invaluable contribution to preparation and organizing of the XXII Olympic winter Games and XI Paralympic Winter Games of 2014 in Sochi. 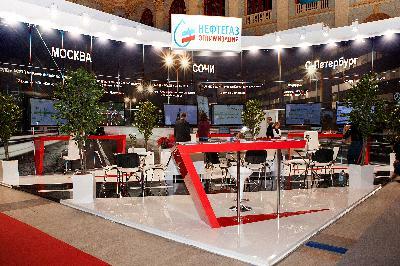 10 March 2014 CJSC NGO is the sole Russian participant of the international exhibition "Intertraffic - 2014"
CJSC «Neftegazoptimizatsya» (NGO) is the first company in the Russian Federation which realized large-scale projects on preparation of transport infrastructure of the city of Sochi hosting the Olympic Games for holding the Winter Olympic and Paralympic Games of 2014. Until the end of 2013 CJSC NGO completely finished works on modernization of existing road network in Sochi, construction of Automated Traffic Management System (ATMS) both for Sochi and for its new built highway system conforming to all modern international standards, including – Automated Traffic Management System (ATMS) and Automated Traffic Management System for Technological Processes (AMSTP) of Relief road of Kurortny prospect. Also during Olympic and the Paralympic Winter Games the Traffic Management Master Plan was integrated in Sochi. CJSC NGO Our is the sole Russian participant of the international exhibition "Intertraffic - 2014" which will take place in Amsterdam from Tuesday 25th to Friday 28th of March 2014. This recognized international event which is carried out once in two years joins together on its platforms the most advanced representatives of Intelligent Transport System branch. CJSC NGO will present its main realized projects, opportunities and achievements of our company, including our projects in the Olympic Sochi, Saint Petersburg and Moscow. CJSC NGO obtained the National Award «Company of the Year in 2013» in the nomination "Development of Intelligent Transport Systems." 26 November 2013 CJSC NGO will participate in the VII International Exhibition "Transport of Russia"
During the VII International Exhibition "Transport of Russia" which will take place in the Moscow exhibition Center Gostiniy Dvor from 5th to 7th of December 2013 CJSC NGO will present its realized and ongoing projects applying the latest innovations in intelligent traffic management branch. 23 October 2013 The NGO Software «IntellectTraffic» gets the Award "Product of the Year". 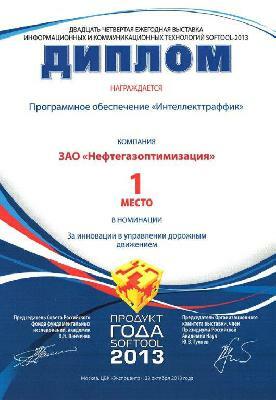 The proprietary NGO Software «IntellectTraffic» obtained the National Award «SOFTOOL - PRODUCT OF THE YEAR 2013» in the nomination "Innovations in Transport Management"
The award "Product of the Year" is the annual Russian National Award with goes to the product / service / technology elected by the vote of the Expert Council in accordance with the award’s procedure. This Award is initiated by the Russian Academy of Sciences, Ministry of Communications and Mass Communications of Russian Federation, Russian Foundation for Basic Research, etc.